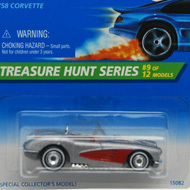 8/12 from the 1996 Treasure Hunt series. 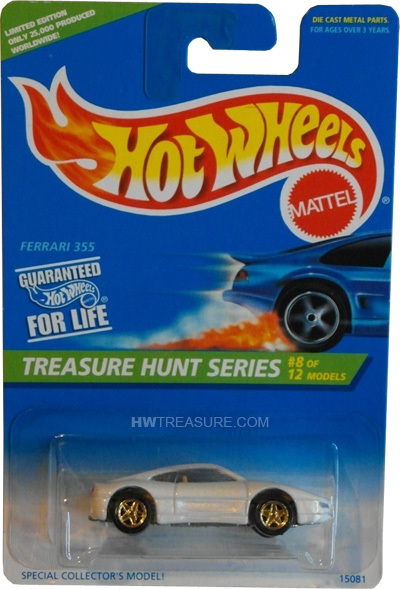 The Ferrari features pearl white paint with a gold Hot Wheels logo on the back. It has clear windows, a tan interior, gold 5-spoke Pro-Circuit wheels, and an unpainted Malaysia base. The car first appeared in the 1995 New Model series and is based upon the actual vehicle that was built from 1994 to 1999. It is not the only Ferrari in the 1996 set and is joined by the Ferrari 250.